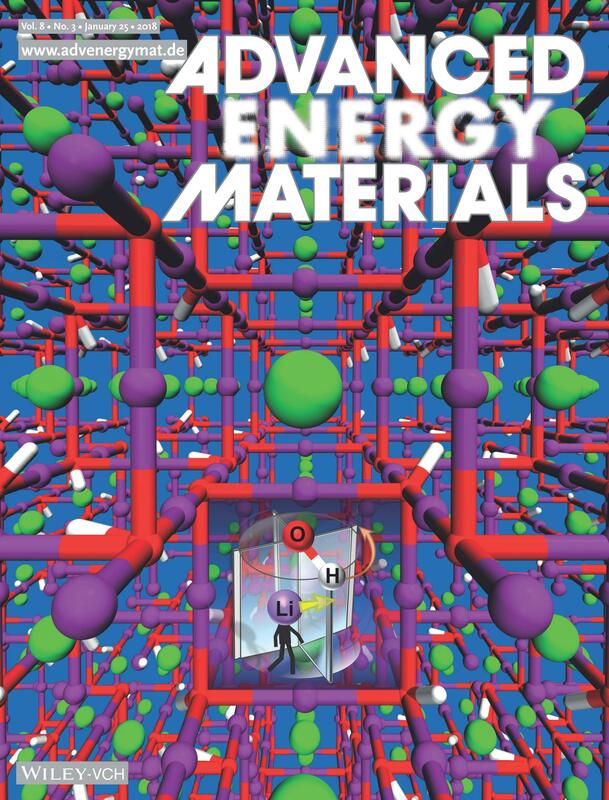 The joint modeling and experimental work reports on the progress towards the discovery of novel solid state electrolytes that would allow for these improvements to be made, and is featured on the cover of the prestigious Advanced Energy Materials journal. Novel electrolytes for batteries are needed to facilitate the development of lighter and safer energy storage devices in order to unburden the Soldier and reduce logistics requirements. Improved non-flammable, non-toxic, low-cost and lightweight solid electrolytes have a great potential to enable the use of lithium metal technology resulting in increased energy density and lighter batteries. In this article, Dr. Oleg Borodin, Professor Gleb Yushin and co-workers examined the lithium hydroxyl chloride and deprotonated lithium hydroxychlorides to reveal the influence of the proton of the hydroxyl group on the Li ion conductivities in these types of compounds. Born-Oppenheimer molecular dynamics simulations show an excellent agreement with experimental results and reveal an unexpected lithium transport mechanism, which is coupled with rotation of the hydroxyl group. Rotating doors in buildings may serve as simple mechanical analogies for Li+ motion. Borodin, research scientist in ARL's Electrochemistry Branch, led the modeling portion of the work while the experimental work was done under the guidance of Yushin from the Georgia Institute of Technology. "Solid state electrolytes have a potential to simultaneously increase battery energy density resulting in lighter batteries while improving safety and reducing cost," Borodin said. According to the Modern War Institute, the two main culprits on today's battlefield are batteries and body armor. Almost everything a Soldier carries requires batteries, which can add almost 20 pounds to their load-a problem Soldiers have only contended with in the past generation. "Development of safer and lighter batteries would also greatly benefit the silent watch capabilities of armored vehicles and extending the mission time of smaller unmanned aerial vehicles that could make a difference between returning to the base or not," Borodin said. One crucial aspect of this research is the collaborative aspect, which Borodin says makes the effort so promising. "Collaboration with world leading groups such as Professor Yushin's group from Georgia Tech is critical for staying at the leading edge of the rapidly changing technology," Borodin said. "Research and development progress is greatly accelerated by combining ideas and extending ARL capabilities and expertise with both fundamental understanding of underlying electrochemical processes accomplished through modeling and simulations and state-of-the-art synthesis and characterization capabilities." This work supports the Army Modernization Priority of Soldier Lethality by providing higher energy density batteries for Soldiers to increase their mission duration, reduce the load, and increase safety over current battery technologies. Further improvement of solid state electrolyte conductivity and interfacial electrolyte properties is currently underway to enable future commercialization of this class of electrolyte. According to Borodin, outside of the Department of Defense, solid electrolytes are actively researched due to their potential to replace the currently used liquid electrolytes in large format batteries for electric vehicles, providing critically needed improvement in safety and extending driving range in addition to a wide range of applications from backup power and portable electronics. The details of this research were published in Ion Conductivities: Protons Enhance Conductivities in Lithium Halide Hydroxide/Lithium Oxyhalide Solid Electrolytes by Forming Rotating Hydroxy Groups (Advanced Energy Materials 3/2018).